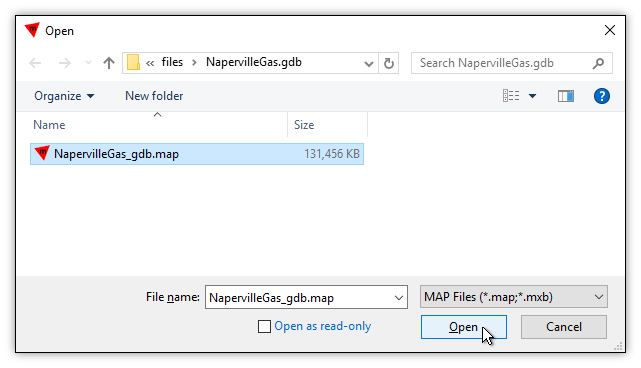 This topic shows how to convert data in ESRI's current file geodatabase format into a Manifold .map project in a single step. We convert ESRI's example NapervilleGas GDB geodatabase, all 857 files, into a single, unified Manifold .map project. ESRI's file geodatabase format is new "geodatabase" format introduced by ESRI in ArcGIS 9.2. Data in a file geodatabase is stored within a folder in the Windows file system in the form of very many files, all of which must travel together in an ensemble to avoid damage. 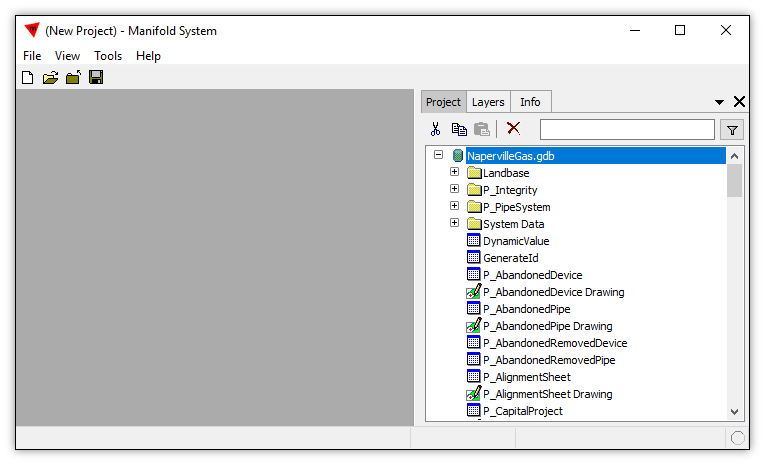 The tiny NapervilleGas example published by ESRI and used in this topic requires 857 separate files. Despite the obvious risk of storing valuable data in the form of hundreds and hundreds of Windows files, all of which must travel together as a unified ensemble, ESRI file geodatabase format has become the standard for current ESRI products and is promoted by ESRI over personal geodatabase format. ESRI users seem to agree that personal geodatabases as a format are on their way out, being replaced by file geodatabases. Manifold users will want to convert their file geodatabases into either Manifold .map projects for immediate, high-speed use or into ultra-compact Manifold .mxb archive files for archival storage and exchange. While personal geodatabases only require keeping track of a single .mdb file, the sheer inconvenience and risk of dragging along hundreds of files within a file geodatabase will make conversion into a single, totally reliable, ultra high speed .map file or ultra compact .mxb file a priority in the case of file geodatabases. We will use the NapervilleGas geodatabase published by ESRI. 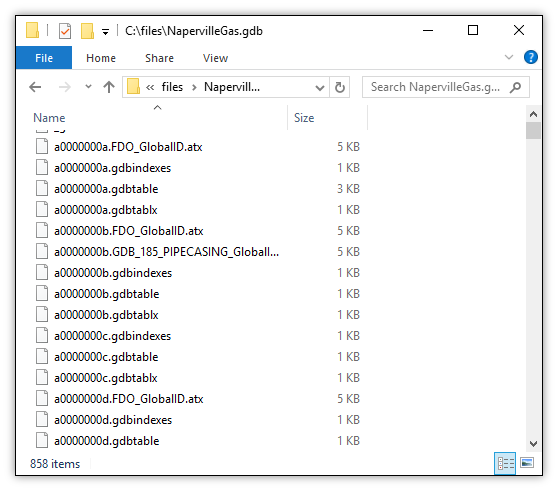 The "geodatabase" consists of a Windows folder called NapervilleGas.gdb that contains 857 files, or 858 files as in the illustration above if the ESRI gdb driver has the geodatabase open and has created one more file, a lock file, in the folder. 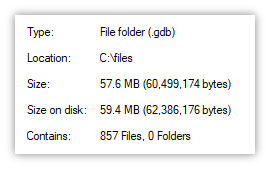 One, and only one, of those 857 files has the name gdb without any extension. That file is the entry point to the geodatabase and is the file we choose when linking a file geodatabase into Manifold. We launch Manifold and choose File - Link. 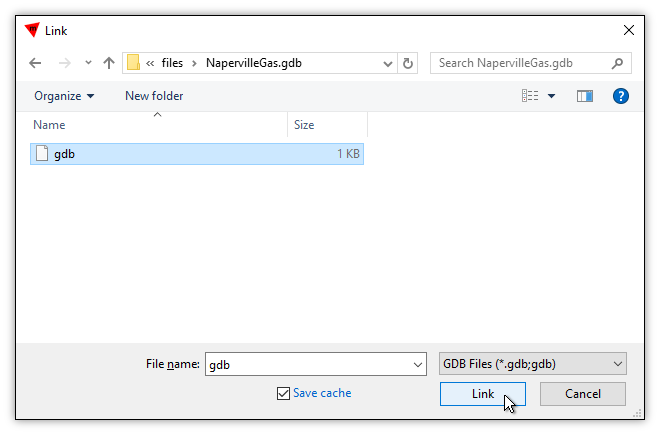 Choose GDB Files as the type of file and navigate into the NapervilleGas.gdb folder that holds the geodatabase files. Since we have selected GDB Files as the type of file Manifold will spare us the need to scroll through hundreds of files and will show only the gdb file. We click on that and then choose Link. A new data source called gdb appears in the project. We click on the + box by the name of the data source to expand the data source, to see the many drawings and tables that are stored in the geodatabase. Next, we Right-click onto the gdb data source. From the context menu that appears we choose Export. 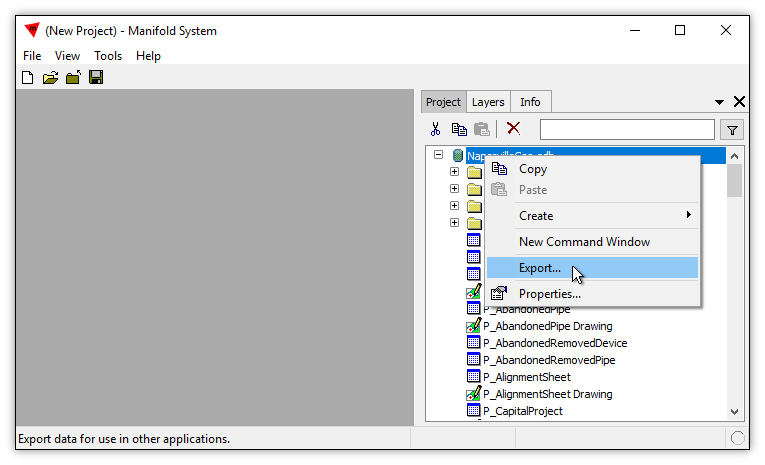 In the Export dialog, we can choose between .map, .mml and .mxb formats. .mml is a specialized format used for development. .mxb is a compressed, archival form of .map format. .map is regular Manifold .map format. If we want to export to a .map file we choose MAP Files as the type. We provide a name for the new .map file and we press Export. Done! In the Export dialog, if we want to export to an .mxb file we choose MXB Files as the type. We provide a name for the new .mxb file and we press Export. Done! We can verify that the data source has been exported into a new .map project by opening the newly-created .map file in a new project. In a new, blank Manifold session we choose File - Open. We navigate to where we saved our .map and, if we also exported it, our .mxb files. We click on the .map and choose Open. The .map project opens instantly, and we see that the export process did, indeed, convert all of the NapervilleGas file geodatabase content into a single, high-performance .map project. In the illustration below we have used Style to color the areas in the TaxParcel Drawing using the OBJECTID field using the equal count method with 8 breaks and the CB Paired palette. If we had opened the Manifold .mxb archive, we would have reconstituted the above project as well. The only difference would be that the .mxb would not open instantaneously as does Manifold's everyday working format, .map, since the .mxb compressed archive file must first automatically be decompressed into .map form. We can compare file sizes when storing the same spatial data in ESRI form or Manifold form. Right-clicking onto the NapervilleGas.gdb folder and choosing Properties gives the above report from Windows. The file geodatabase in native ESRI file geodatabase format, ready for use within ArcGIS, occupies about 60 MB and requires 857 files. Converted to a .map the spatial data occupies about 131 MB, roughly twice the size of the original ESRI file geodatabase, but only one file is required. That one file, of course, is also fully parallel Radian technology delivering speed many times faster than possible with geodatabase format. Manifold's MXB archive and exchange format has been designed to compress Manifold projects as good as or better than zip technology. 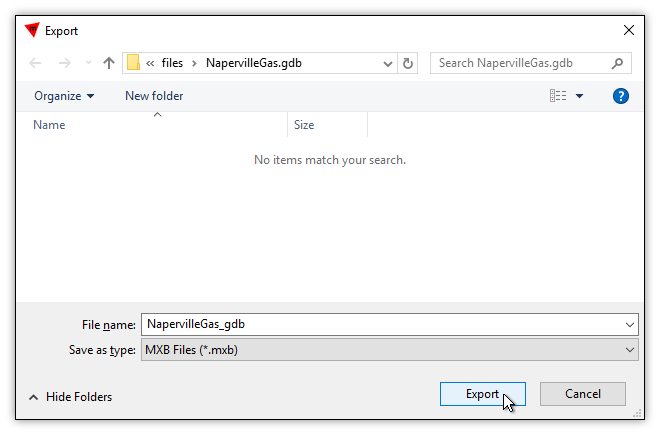 When converting a personal geodatabase into a Manifold project the resulting .mxb archive file will usually be significantly smaller than a zip file containing the personal geodatabase in Microsoft Access .mdb format. With file geodatabases a zipped geodatabase will often be about the same size as an equivalent .mxb archive file or even slightly smaller. In the case of the NapervilleGas file geodatabase, when ESRI's 857 files are zipped together into a single zip file they occupy under 21 MB. The equivalent Manifold .mxb file is 24 MB, slightly bigger. As file geodatabases get bigger, the difference between the zip file and the .mxb tends to get smaller, with the .mxb becoming smaller in some cases depending on the file geodatabase. Personal geodatabases - The original ArcGIS geodatabase format. Data stored and managed in Microsoft Access .mdb files, and thus subject to all the limitations and inconveniences of .mdb format in a 64-bit world. Limited to 2 GB with performance typically degrading between 250 MB and 500 MB. ESRI users seem to agree that personal geodatabases as a format are on their way out, being replaced by file geodatabases. File geodatabases - A new "geodatabase" format introduced by ESRI in ArcGIS 9.2. Stores data within a folder in the Windows file system in the form of very many files, all of which must travel together in an ensemble to avoid damage. The tiny NapervilleGas example published by ESRI and used in this documentation requires 857 separate files. Enterprise geodatabases - Requires ArcSDE. Stores spatial data within ESRI's proprietary SDE technology in Oracle, SQL Server, PostgreSQL, Informix and DB2. Provides potentially unlimited storage for multiple users. 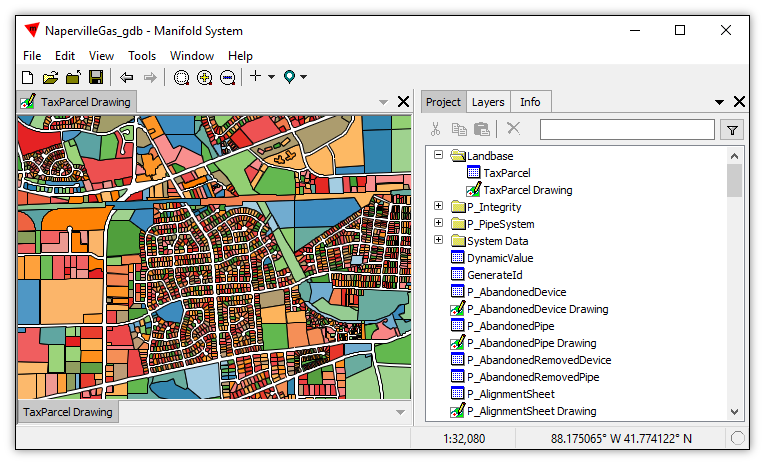 Manifold can link into a project as a data source all of the above three ESRI geodatabase formats. Viewer is Free - Manifold Viewer provides a free viewer to explore and to analyze sophisticated databases. 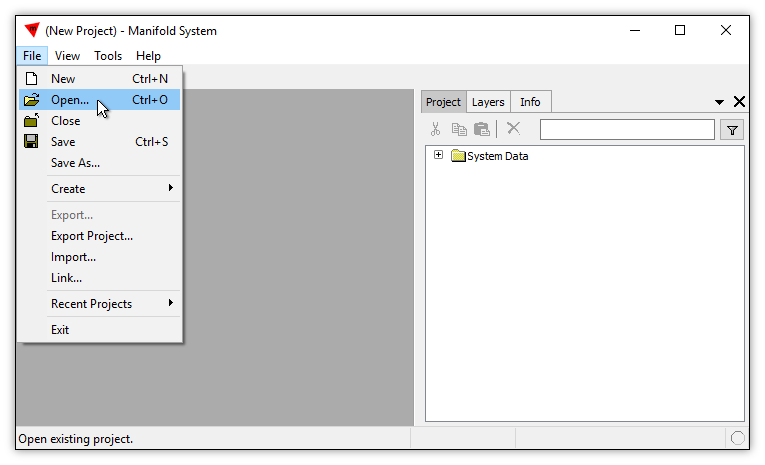 Although Viewer is perfectly capable of connecting to the above three different forms of ESRI geodatabases, it makes way more sense to publish such data in the form of .mxb files for people who are using Viewer. Manifold Viewer - View GDB Faster than ArcGIS Explorer - ESRI's ArcGIS Explorer product is a free viewer that allows ESRI people to view ESRI GDB Geodatabases, along with other data. Unfortunately, ESRI has stopped producing Explorer and has replaced it with ArcGIS Earth, which cannot connect to and display ESRI GDB Geodatabases. The video compares Explorer to Viewer side-by-side so ESRI users can see that if they need to continue viewing GDB Geodatabases for free they can reliably use Viewer for fast, high quality GDB viewing. 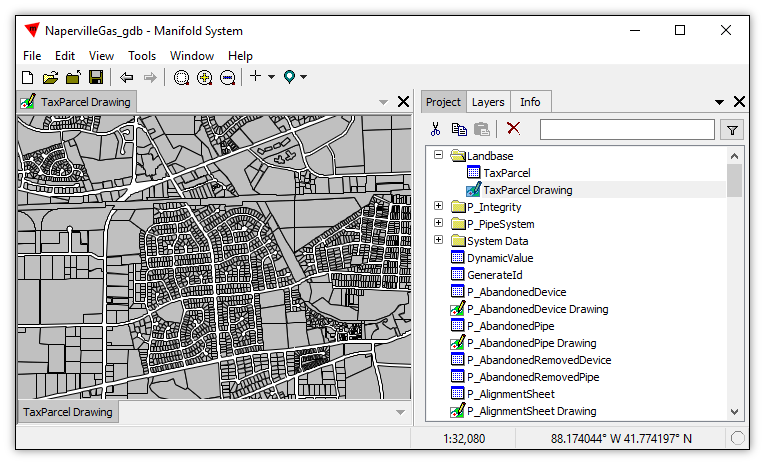 Example: Convert an ESRI Personal Geodatabase into a .map Project - How to convert data in ESRI's legacy personal geodatabase format into a Manifold .map project in a single step. Example: Connect to an ESRI GDB File Geodatabase - Connect Manifold to an ESRI GDB file geodatabase, display the contents, make a selection in the GDB and overlay in a map. Example: Connect to an ESRI GDB usng GDAL/OGR - Instead of using Manifold's built-in ability to connect to modern ESRI GDB file geodatabases, use the Manifold GDAL/OGR dataport to take advantage of the GDAL library's ability to connect to deprecated GDB formats. Example: Connect LibreOffice Through Manifold to an ESRI GDB - A companion example topic to the Example: Connect Through Manifold ODBC to a Third Party topic. 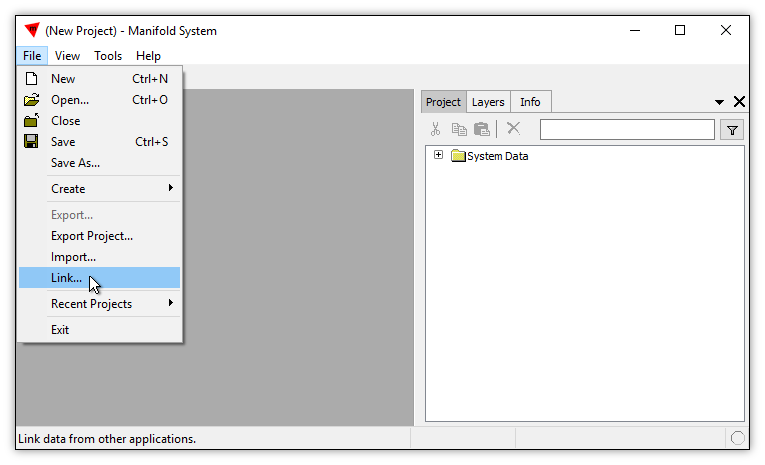 Shows how to connect LibreOffice Base, the database part of LIbreOffice, through Manifold to link an ESRI GDB file geodatabase table into LibreOffice.